47th Antique Auto Festival in Eureka Springs! Crank up your engines and get ready! On September 8th & 9th, Eureka Springs will host the 47th Annual Antique Auto Festival — located at the Great Passion Play @ 935 Passion Play Road. Saturday morning at 9am, judges will view all of the cars that have entered and pick this year’s winner! 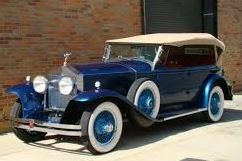 This is a great time to visit the Great Passion Play grounds and see all of the antique cars up close. After the awards ceremony at 3pm, there will be a parade thru downtown of all of the cars at 4pm — the parade will start at the Passion Play grounds and go thru Downtown. Click here for the official website. 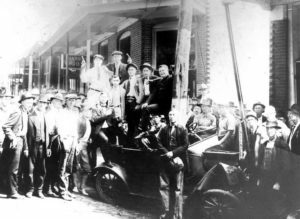 Immediately following the parade, there will be a re-enactment of the unsuccessful 1922 Bank Robbery on Downtown Spring Street. This is a really cool story. Everyone can line Spring Street to watch this event. The bad guys will be chased by the good guys and it will be quite enjoyable to watch! During the parade, the folks re-enacting the bank robbery will be all around in the crowd — don’t be alarmed when you see the action happening! If you want a spoiler…. click here for the story. We are excited to attend our first Eureka Springs Antique Auto Festival and Re-enactment of the 1922 Bank Robery. It will be cool to see all of the antique cars and even get in with the mob to help catch the bank robbers! If you are looking for a great place to stay for the weekend, we would love to have you stay at The Woods Cabins! Tonight we saw a show that was truly amazing here in Eureka Springs at the Intrigue Theater. Illusionists Sean-Paul and Juliane have created an amazing show entitled The Illusionist and the Ghost talker. They have turned a hundred year old church into their venue seating about 75 people. The event is actually three shows: the intro, performed by one of the staff was a short set with comedy and a few very corny magic tricks to prep the crowd for the main event. Next up is Sean-Paul who delights you with stories and illusions for the next hour. He did five illusions, involving the audience and thoroughly entertaining all of us. His presentation is superb and such a professional. Juliane is his assistant during the acts and she also does some things that are amazing as well as very funny. No spoilers here, you HAVE to go see them. At the end of Sean-Pauls act is a small intermission and then the headliner is Juliane and Sean-Paul as her assistant as she communicates with the spirits. I have seen acts like this on the internet and TV, and always KNEW the crowd had given information to the artists beforehand. That was, of course, before Debbie and I were one of the ‘targets’. We were asked to hold something unique in our hand while Sean-Paul walked around with a mike and a blindfolded Juliane (blindfolded and ears checks for any listening devices by a audience member) on stage to pass on what the spirits told her. Not only did she identify the purse hook Debbie had, but also mentioned we were both in IT, I was a Packer fan, from Illinois and also a message from the spirits to remind me that next week was Debbie’s birthday since I forget that date a lot. These guys will be appearing on Penn & Tellers show Fool Us in early August so you can get a taste of the act. 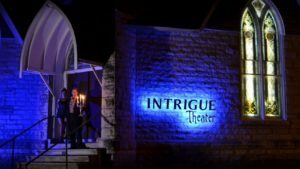 You can get tickets here and find out more about this stunning Eureka Springs attraction here.